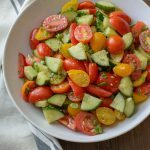 The hot weather is upon us here in Texas, and that has me craving easy, no-cook side dishes like this Tomato and Cucumber Salad. It couldn’t be any easier to make, and you will absolutely love the delicious parmesan garlic dressing! It’s only the start of June, and we have already had temps reaching into the high nineties here. I feel like we didn’t really get to enjoy Spring, and then bam, hello Summer! That’s Texas for ya. We recently moved during some of those hot days, so that was fun. Ha! 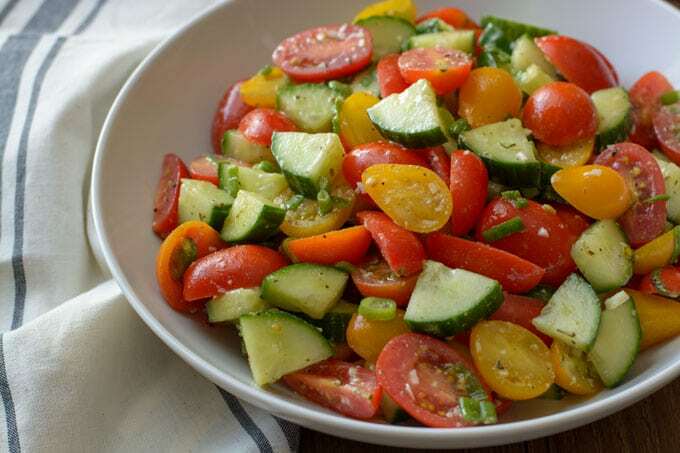 It’s important to have nice and sweet tomatoes for a dish like this Tomato and Cucumber Salad. Trader Joe’s had some really good looking containers of the organic mixed medley cherry tomatoes last Sunday, and they were just perfect. You can just use all red tomatoes, but I do like the contrast of colors with the medley. When the cherry tomatoes are looking good, I love to make all kinds of these salads. If you are as big of them as I am, I have another Tomato Cucumber Salad recipe that’s super tasty as well. How Long Does Tomato Cucumber Salad Last? This salad will keep for up to two days, but it will get more watery as it sits. It’s best eaten the day it’s made. 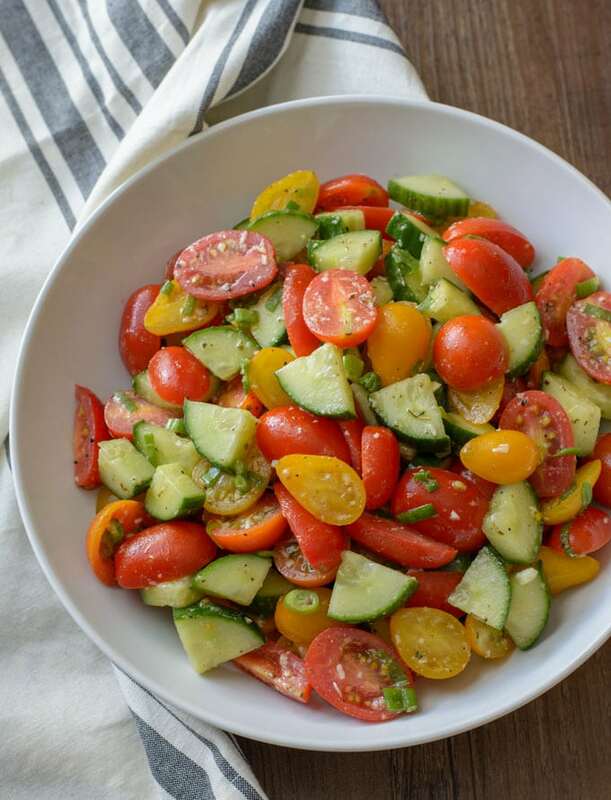 What to Serve With Tomato Cucumber Salad? This salad would be a good healthy side dish to serve with grilled chicken or even steak. A delicious and fresh salad made with grape or cherry tomatoes and English cucumber tossed with a tasty parmesan garlic vinaigrette dressing. In the bottom of a large bowl, whisk together the olive oil, vinegar, garlic, sea salt and Italian seasoning. Add the cheese and gently whisk again. Add the vegetables and toss well to combine. Serve immediately or cover and refrigerate until ready to serve. Salad will keep for two days but will get more watery as it sits. If you can't find or want a slightly less expensive option than Parmigiano Reggiano cheese, you can substitute Grana Padano cheese. They are similar in flavor and both are available at Trader Joe's.